I'm Definitely very excited to review these new products by L'Oreal these are the L'Oreal Colour Riche Caresse Aqua Lacquer Lip Stain which were a gift. 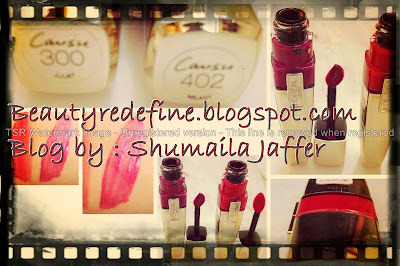 (Click here to see my Haul Post) To be honest I was expecting Lakme's lipstick instead i got these stains. at its first look i thought its a gloss which i don't like. Yes, it is a gloss!! But did i like it ? Wanna know what happened when i tried it ? so Lets get to the review. Discover a stain that thinks it’s a gloss. Now hydration & shine meet lasting, lightweight color. Colour Riche Aqua Lip Shine Stain combines the power of a lip stain with lip-gloss luster. This next generation lip stain, formulated with a blend of light hydrating oils & concentrated pigments, delivers lasting color with a glossy finish. 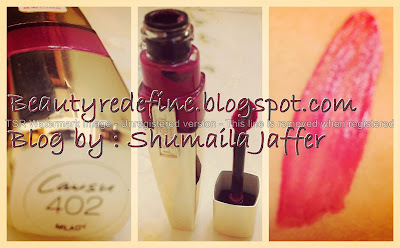 Colour Riche Caresse Liquid Lip Lacquer by L'Oreal is a water based stain formula with high shine. The luminous lip color is more comparable to a traditional lipstick, although this product too is lighter weight than a traditional lipstick. To Start with they are said to be dupes of YSL Glossy Stains which I personally don't own so can't really compare if they are HIT as dupes or not. Shade 402 - Milady : It is a purple/pinkish berry shade. It looks like purple from outside. I think its such a great product to have when you want long lasting effect without touch ups. 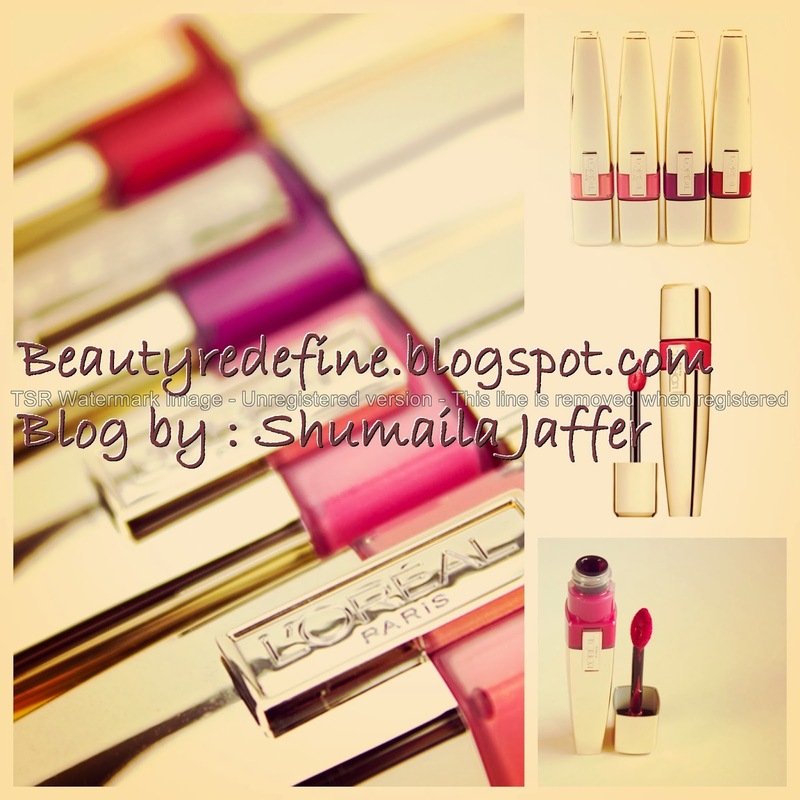 It applies smoothly like butter and in one go you get the perfect glossy shiny lips. Its a watery formula and a Glossy stain, thus being called Wet shine stain .I suggest You first apply a light layer leave for a minute then apply another layer. You can build up the colour but you must be careful not to apply it all at the same time. It is a perfect hybrid of gloss and lip color. The moment I apply it, I feel a tingling sensation of runny liquid drying up into a thick gloss on your lips, It is thick and sticky to remain intact on the lips up to several hours and hydrate my lips as long as it stays. I have a chapped lips whole year and I wondered if it would dry out my lips like stains usally does. Instead, it becomes so soft, light, moist and keep my lips hydrated without enhancing fine lips on my lips. I do like these as you really feel like you have no product on your lips. but once they were removed I had to apply lip balm. The packaging is very sleek they come in a gold tube with a clear band so one can actually get an idea of the shade inside. and remains intact for up to 6 hours (with meals too) and then does fades slightly. I was surprised to notice that it is 100% non-transferable! The applicator is petal-shaped to ensure easy and even application at every nook and corner of lips. perfect for very nice precise application even at the corners of your mouth. it have Light scented smell of the essence of crushed rose petals but the smell too fades away. 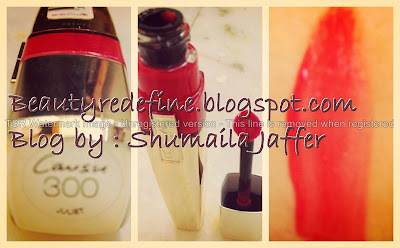 So over all this has been my favorite lip product for now and i will really recommend you to give this lip stain a try. Have you tried this product ? which is your favorite stain ? did you like my review ? I love the top red. Lovely shades. lovely shades and the packaging! how long does this last? I've tried the product and am not a huge fan of the applicator, but their color selection's super super nice! all the sahdes are perfect for Christmas time - great night out with that one. im not a fan of glosses but this one is soemthing i would like to try! very nice shades! thanks for the review dear! I've been looking for good lipstains and thanks to your review, I can go out and get this one! These sound fabulous! I love the formula from your descriptions. I haven't tried these yet, but I definitely want to ASAP! the stains seem so good, better than the ones by rimmel...gotta try! Instead of this, you should try the NYX lip creams, they're so much better, I did a review on them not too long ago too =D Much better than any stains or lipsticks..